While We have closed our brick and mortar location (for the time being) all training classes can be hosted in other locations. Our goal at D.A.T. is to provide a fun yet real environment which will encourage open forum discussion to help students understand the concepts of self-defense. In our program the student will be challenged. We understand each student is unique as is his/her background, abilities, and learning styles. Therefore, the pace of the program will be tailored to each student. 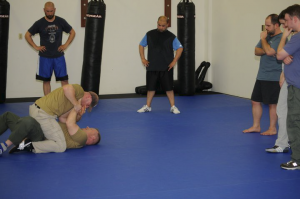 Our multi-disciplined instructors are highly trained and will ensure your safety while providing real-world training that could save your life. Please use the menu above to navigate to the Training Center standard courses and Specialty Courses.